At the H4 chart of the USD/CAD currency pair, the Alligator is opening its mouth downwards. 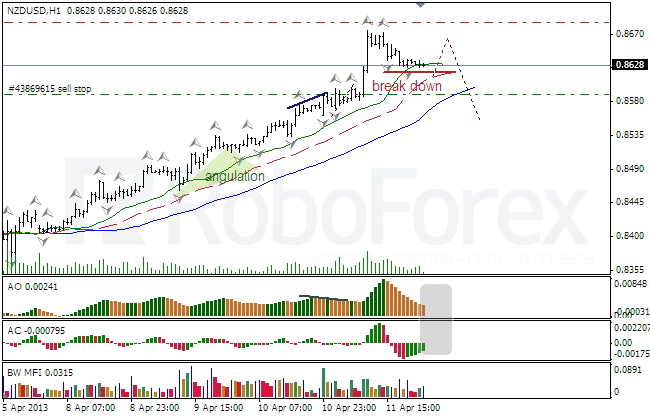 The price completed a bearish fractal; AO and AC indicators are in the red zone so far; there is a Fade bar on the MFI. I’m planning to open more buy orders after the price forms several consecutive fractals. At the H1 chart of the USD/CAD currency pair, the Alligator woke up downwards. AO and AC indicators are in the green zone, but there is no activity on the MFI. I’m staying out of the market. At the H4 chart of the NZD/USD currency pair, the Alligator’s mouth is opened upwards. The price formed a bullish fractal; the angle of angulation is still open, the indicators are in the grey zone; there is a Squat bar on the MFI. I’m placing a pending sell order. At the H1 chart of the NZD/USD currency pair, the Alligator is slowly going to sleep. AO and AC indicators are in the grey zone; there is a Green bar on the MFI. I opened a pending order with the target below the Alligator’s jaw; a protective stop is above bullish fractals.